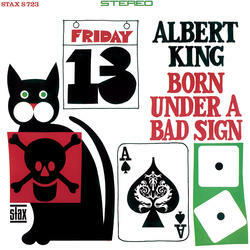 "Born Under A Bad Sign" became one of the most influential recordings in the history of the blues. Right from the title song, he travels along familiar tracks in the blues world, occasionally making a detour to hectic, soulful realms ("Crosscut Saw") and letting himself be carried away by strident winds ("Kansas City"). Over and over again, the musicians surprise one with ever new sound colorings, as in the hum and buzz of "Oh, Pretty Woman", the brusque admonitory "Down Don’t Bother Me", or the swinging fiddling of "The Hunter".